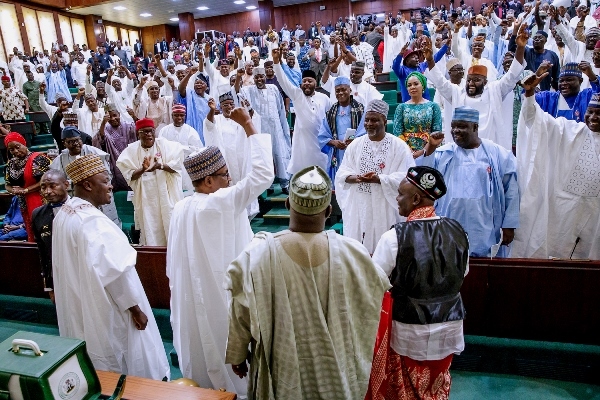 It was a rowdy session with cheers and jeers as President Muhammadu Buhari presented the $28.9 billion 2019 budget proposal to the joint session of the senate and house of Representatives. The behaviour of the lawmaker forced Buhari to pause, looked at directions of the lawmakers, and ward: “The world is watching you, you are above this’’, and continued to read the budget speech undaunted. The President arrived at the National assembly on Wednesday afternoon, walked into the chamber into the embrace of cheers and jeers. While his supporters praised him, opposition lawmakers booed him and sang freedom songs. After pausing for the National Anthem, the chamber became rowdy again as several lawmakers began booing him. In a bid to defend the President, the ruling All Progressives Congress (APC) lawmakers raised their voices to drown the scoffing opposition. The 2019 is $984 million lower than the current 2018 budget. According to Buhari, $13.3 billion or 50.31 per cent is earmarked for recurrent expenditure and 22.98 per cent earmarked for capital projects. The remaining percentage is for statutory transfers, debt servicing and sinking fund. President Buhari identified infrastructure development as one of the areas in which his administration had made a lot of progress. He said that the 2018 budget recorded a performance of 67 per cent. He said that the Federal Government carried over capital projects that were not likely to be fully funded by 2018 to 2019. According to him, the 2019 budget is intended to further place the economy on the path of inclusive, diversified and sustainable growth in order to continue to lift a significant number of citizens out of poverty. He stated that government’s approach on infrastructure was a logical one as it simply prioritised the completion of critical on-going projects over the introduction of new ones. The Federal Government identified 116 abandoned or uncompleted projects relating to irrigation, dams, drainage and water supply. He identified them the completed and/or commissioned projects to include- Central Ogbia Regional Water Project in Bayelsa State; Northern Ishan Regional Water Supply Project, Edo; Sabke Water Supply Project, Katsina State and Takum Water Supply Project in Taraba. Others, according to the president, are Ogwashi – Uku Dam in Delta; Shagari Irrigation Project in Sokoto State, Galma Dam, Kaduna State; Mangu Water Supply Project, Plateau State as well as the Federal University of Agriculture and Makurdi Water Supply Project in Benue. He said that his administration also made giant strides in the railway sector. “We completed and commissioned the Abuja – Kaduna Rail Line and the Abuja Metro-Rail Project. Similarly, the previously abandoned Itakpe-Ajaokuta-Warri Rail Line is undergoing test runs and will soon be commissioned. “We are also on track for the Lagos – Kano rail line as significant progress has been made on the Lagos to Ibadan segment of the project. “ We remain committed to rebuilding and expanding our road network. In 2018, an additional 1,531 kilometres of roads have been constructed and 1,008 kilometers rehabilitated across the country. “Priority projects such as the Abuja – Kaduna – Kano highway as well as the Second Niger Bridge are well underway through the Presidential Infrastructure Development Fund,’’ he said. The president also disclosed that in every state of the federation there was a major Federal road project going on and released a breakdown on the number of projects in each of the six geo-political areas. Meanwhile, Senator Godswill Akpabio (APC-Akwa Ibom) described Senate President Bukola Saraki and Speaker Yakubu Dogara as weak and asked them to resign before they were forced out as they were no longer capable of functioning. Akpabio, a former ally of Saraki and Dogara, said his former political friends were now weak because they were unable to deliver their addresses during President Buhari’s budget presentation. Saraki and Dogara, who abandoned the ruling APC and went back to the PDP, the party they left in 2014, were expected to make opening and closing remarks respectively before and after the presentation. 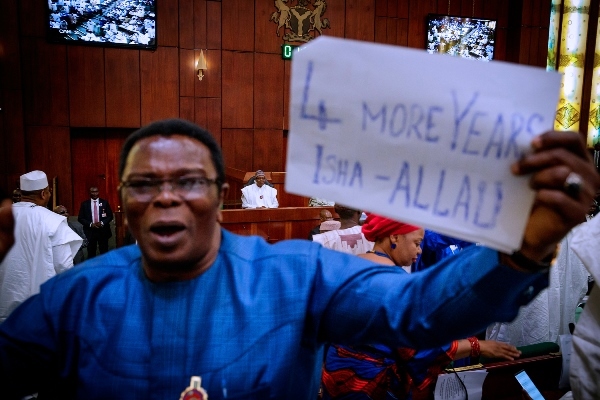 However, the rowdy session caused by PDP lawmakers at the presentation made it impossible for the two presiding officers to deliver their addresses. Reacting to the development, Akpabio, a former governor of Akwa Ibom state, said Saraki and Dogara could not speak because they were no longer qualified to do so. The former senate minority leader said: “They really couldn’t talk because they shouldn’t be sitting on those seats since they now belong to a minority party. “So I will expect that what has happened today should be a wake-up call on the Speaker and the Senate President to resign peacefully,” he said.